Non Profit & Art Events Happening in December! ﻿ Open now until the trees are gone! The Jennifer Perlmutter Gallery presents the 3rd Annual Small Things Exhibit. Over 35 artists have been chosen to display 3D and 2D artworks in a variety of media and styles, all priced under $500. Find the perfect gift or start your art collection with affordable works from local artists. Discerning shoppers will find an array of unique handcrafted items. Gallery hours are Wed - Saturday, Noon to 6:00pm or by appointment. Check the website for additional holiday hours and events. www.jenniferperlmuttergallery.com. In the spirit of the season, the Moraga Art Gallery presents “Holiday Magic in Porcelain and Paint” a colorful new show featuring the works of two of Lamorinda’s most celebrated artists: Lafayette’s Donna Arganbright and Orinda’s Maria SantoStefano. The gallery’s show, which also includes work by its 14 member artists, runs through January 5. The gallery is located in the Rheem Shopping Center, 522 Center Street, Moraga. Extended December hours are from 10:00 to 6:00 daily through December 24th. For more information, visit http://www.moragaartgallery.com or call 925-376-5407. By dedicating a memorial light for a minimum of $30 or becoming a tree donor, you can memorialize a loved one who has passed or honor someone who is living while directly supporting Hospice East Bay. To ensure that more of your gift goes toward our patients and programs, we will not be mailing acknowledgments via the post office. The notification you receive as an email will serve as your receipt and acknowledgement. Memorial Light Sponsors who support Hospice East Bay by dedicating up to three memorial lights for $100 will have their names listed in their chosen event program as a Memorial Light. Lights dedicated by gifts of at least $30 will provide the option to memorialize/honor loved ones in the book of names and have their name(s) read at the tree lighting ceremony of choice. Please purchase your Memorial Light at least 7 days in advance of the event you wish to attend to ensure your loved one's name is read. Learn more here. Not to miss! This FREE event features 60+ artists and their handcrafts. Also featured are the Celebrity Gift Baskets thoughtfully created and donated by our local celebrity businesses and residents. Taste homemade goodies like jams, candies and cinnamon rolls. Pick up a few one of a kind items for your neighbor, family or friends. There are many beautiful and creative items to choose from! Learn more here. This fall Performing Academy’s after school programs take a variety of performing opportunities for ages 5-13 years old. Middle School students embark on an epic journey in a world premiere adaptation of Homer’s The Odyssey, while elementary age students sing and dance their way through Disney’s The Jungle Book Kids, and a Musical Theatre Revue centered around student inclusion called Join the Club. Enrollment is open for Spring, 2019 where students ages 5-13 will begin rehearsals for Seussical Kids and Monty Python’s Spamalot! Registration now open for Spring, ushering service available for Lafayette Elementary students! Students grades 2-5 will learn to act, sing and dance as they rehearse and perform in a full scale production of Seussical The Musical complete with lights, sets, costumes and props. Classes are taught by professional teaching artists who are currently working in the musical theatre industry. Performances will be held at the premier theatre in the area, the Lesher Center for the Arts in downtown Walnut Creek. Ushering service available for Lafayette Elementary students. Learn more here. You have the powerful opportunity to impact the life of a vulnerable foster child when you volunteer with Court Appointed Special Advocates (CASA) of Contra Costa County. CASA volunteers work one-on-one with a foster child to ensure that foster children and youth receive needed health, education and therapeutic services, positive social and recreational opportunities, and consistent support. Let's not forget those whose access to fresh fruit is more limited. The Urban Farmers' last Lamorinda harvest of 2018 take place on Dec. 1. You can register your trees if they still have fruit, or become a volunteer picker. The Urban Farmers make sure that the East Bay's backyard fruit doesn't go to waste. Learn more here. The Lamorinda Wine Growers Association presents an evening of local wines, food, dancing and more to the sounds of DIAMOND DAVE! Join us for a fun-filled evening! Tickets are limited, so book early! Must be 21 to attend. Learn more here. Join Santa for the Annual Holiday Tree Lighting Ceremony! Enjoy cookies and hot cocoa in the Commons Park at 6:30 pm with the tree lighting at 7:00 pm. Learn more here. Santa has arrived in Lafayette … and this year he’s staying for breakfast! Celebrate the holidays with a special pancake Breakfast with Santa benefiting the Lafayette Historical Society. Enjoy a private meet and greet with Father Christmas as you savor off-the-menu pancakes, and a choice of freshly squeezed orange juice or pour over coffee courtesy of Sideboard, the site of Lafayette’s original Pioneer Store. 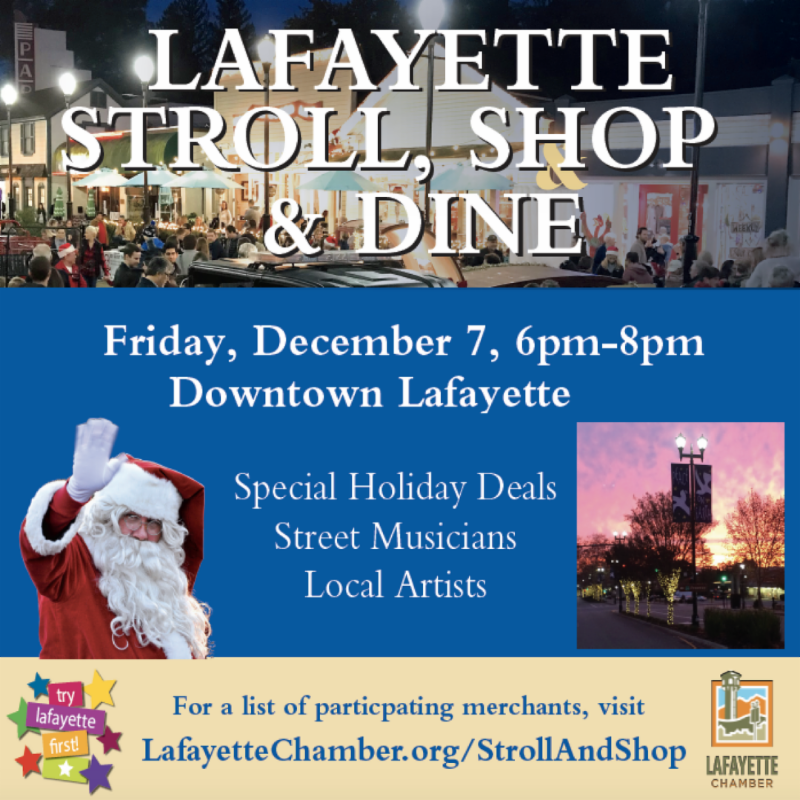 At your table, learn more about Lafayette’s past through historical photos, bring to life a special kids’ coloring sheet and bid on a variety of silent auction items with all proceeds going to the Lafayette Historical Society. 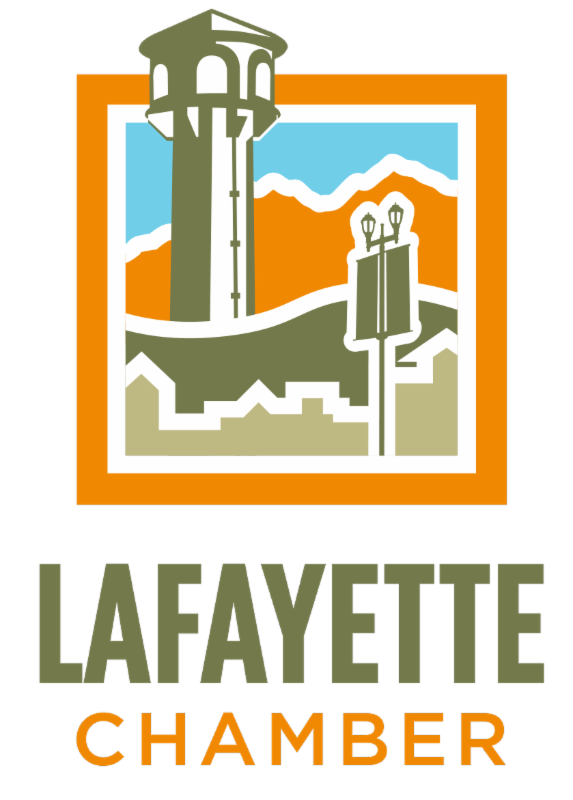 Families also receive an annual family membership to the Lafayette Historical Society through 2019 (value $50). This festive Breakfast with Santa is not only an opportunity to take those precious holiday card photos, but also make memories that will fill your past and inspire your future. Adults: $49; Seniors and Kids 12 and younger: $39. For more information and to book, go to https://www.localfoodadventures.com/breakfast-with-santa/. Aimed at bringing members of the community together in celebration of the holiday season, GCCP will present a special hour-long concert featuring music for Brass Quintet. This Family Holiday Concert is free to the public and is appropriate for families with children of all ages. Limited Seating. Reserve your free ticket at www.gcplayers.org. The cure rate for melanoma treated in its early stages is over 90 per cent and the cure rate for other skin cancers detected early is close to 100 per cent. If you have unwanted or potentially dangerous spots, tags, moles or other skin lesions Have the Doc Check Your Spots for FREE at the One Day Skin Clinic Sunday December 9th from 9AM til Noon at Still Point Wellness Center 953 Mountain View, Lafayette, CA 94549. CLICK HERE TO BOOK YOUR SKIN CHECK APPOINTMENT. You can also get a quote for the cost to have them removed - quickly - naturally - non invasively - on the same day or in the future if you choose. More info here. sewnow! is excited to announce they have re-located to a fabulous new light filled studio at 3455 Golden Gate Way just a block and a half from our former space. Come see their new set-up and all of the creativity that is brewing here. Please join us on December 6 from 5:30 - 7:30 to celebrate our new location and their 12th anniversary in business in Lafayette. Learn more here. Meet other like minded young professionals for a fun holiday mixer at a restaurant with an amazing atmosphere and excellent staff. Friends and coworkers are welcome. We look forward to meeting you there! $15 includes one drink and apps. Saturday, December 8, 9am, 3597 Mt Diablo Blvd. Wednesday, December 12, 5:30pm-7:30pm, 3491 Mt. Diablo Blvd. 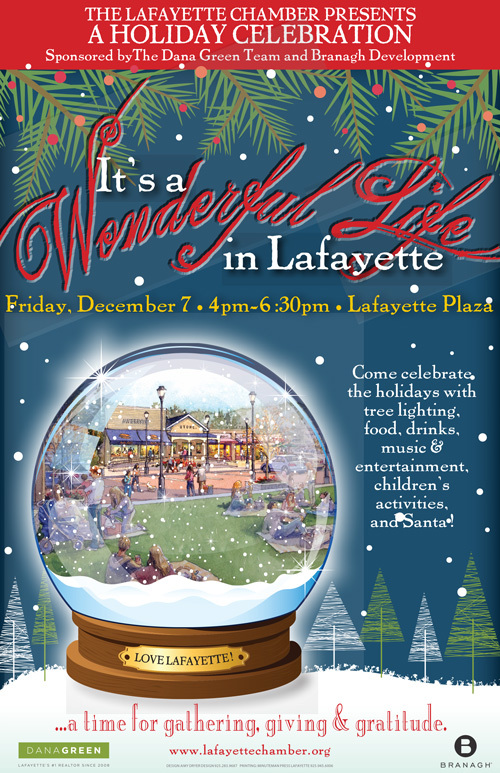 Join us for our December Mixer at Lafayette Library and Learning Center, 3491 Mt. Diablo Boulevard, on Wednesday, December 12 from 5:30pm-7:30pm. Bring a canned food donation of three cans and admission is free! Chamber members, $10, non chamber members $20. Cash only at the door please. Library parking is accessible via First St. and Golden Gate Way. Bring your business cards! Learn more here.